A huge thank you to Nelson jeweller Benjamin Clark of Benjamin Black Goldsmiths who has donated a uniquely crafted ring, which he is auctioning to raise funds for the Nelson Regional Breast Cancer Trust this October. The Pink Ring is valued at a retail price of $1290- and is made with 9 carat white gold, set with a faceted pink tourmaline stone, with the design reflecting the shape of the breast cancer trust’s logo. This is the second time Ben has created a ring in support of the cause, he auctioned one last October. The Pink Ring differs from last year’s design because it is made with white gold (rather than silver) and it resembles the trust’s emblem, but it is the same in that it is a one-off design. The Pink Ring is currently being auctioned on Trade Me until October 13 starting at a one dollar reserve. 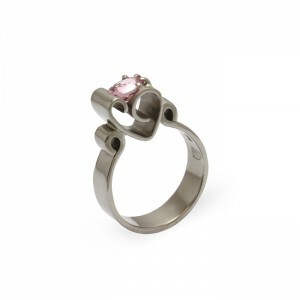 The highest bidder shall win the ring with all proceeds donated to the Nelson Regional Breast Cancer Trust. If you’d like to view The Pink Ring, head over to Benjamin Black Goldsmiths, 176 Bridge Street, Nelson.